guy did well in the director of PEAC’s home, but because he preferred men and had trouble accepting women, we thought we might have a team of female trainers work with him for a few months to give him new learning experiences with a different demographic. We documented Abbi’s incredible progress in a series of three YouTube clips, which you can watch starting HERE. 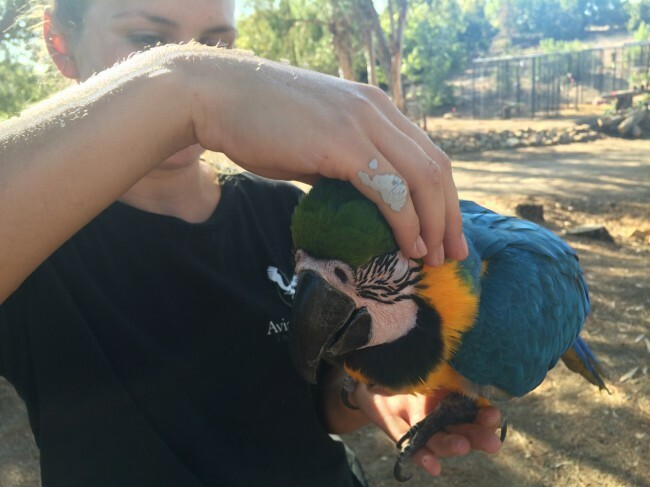 After fielding questions regarding the techniques used and rapid progress we saw with Abbi, I thought it might be useful to start a blog series here covering parrot taming and training myths. There are so many different methodologies for training birds, and while I do not demand that everyone work with animals in exactly the same way, I also do not stand by the maxim, “to each his own.” Not all training techniques are created equal in how they influence stress, aggression, the risk of harm to trainer and animal, bring about short term results, and ensure long-term success. Sometimes we are fooled into perpetuating these mythical techniques because they worked for a specific situation or realized a short-term result, or maybe we don’t recognize how many unnecessary resources actually went in to achieving the desired goals. Some of these methods may even seem to make sense, which is why they are so easily passed from one person to the next. So let’s roll up our sleeves, tease apart these “truisms” that pepper our social media forums, and most importantly, establish a powerful antidote that helps us reach our goals more proficiently. Trying to get a new bird to calm down in our presence can be heart wrenching. Whether that bird lunges at the cage bars as we pass or races to the opposite corner, the bird is usually experiencing physiological signs of elevated stress: dilated pupils, neck and tail feathers flared, depending on the species, beak open…. In some extreme cases the bird could do some real damage to itself. 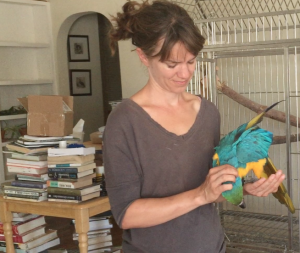 For decades, and indeed, still today, one of the steps to taming the bird was getting it used to our presence by the “chair method:” pulling a chair next to its cage and calmly reading, talking, and/or singing to it, preferably without eye contact. So what is the problem here? It’s not as if the chair sitter is actively engaging with the bird, and the idea is that eventually the bird will calm down because it realizes that we will not do it harm. But are we? 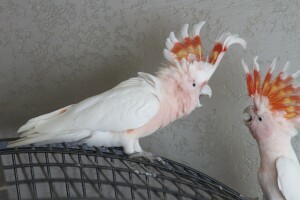 All of the above-described body language is the bird’s way of communicating that it is stressed. By ignoring this communication, we are not building trust, we are stonewalling the bird’s form of dialogue and teaching it that nothing it does will have an effect on its future. It is helpless to control its own outcomes. This can lead to frustration induced aggression and/or apathy in our future work with this bird. 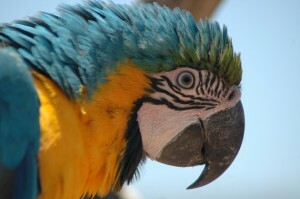 Similarly, it – perhaps unwittingly – promotes insensitive taming techniques by holding out for the bird to “get over it” and give up displaying his signs of distress. When Abbi first arrived here, I let him settle in for the first couple of days before I started our training sessions. During those first few days, I was careful every time I fed him, cleaned his cage, or even passed by to watch his body language. If he looked like he would get aroused, I increased the distance from him until he calmed. In order to service the cage without causing aggression, I would drop him a few treats in a spare bowl on the opposite side of where I needed to exchange his food and water bowls and work quickly to replace his newspapers. Never once did he so much as lift a nape feather at me while I was close. By the time I started formal training sessions a couple of days later, we were both calm and relaxed and he stepped on to my hand within ten minutes, never once showing an inkling of aggressive behavior. It wasn’t what I was telling the parrotlets, it was what I was showing them: their behavior could control my behavior. This gave them power and thus started to build trust. And this is exactly how I worked with Abbi and saw rapid results. Our interactions were short and sweet at first, but laid down the bricks on the pathway to trust. I might have worked with him but 15 minutes a day, spread across a few short sessions, but I was very aware of the time that my behavior was indirectly influencing his behavior. I watched and responded. Staying below the bird’s threshold for fear or aggression means that there is not a deficit to overcome: the bird doesn’t see you as a source of stress. You are a neutral, or, potentially, a positive stimulus that the bird learns to look forward to working with. The initial training sessions ideally stay short and leave the bird wanting for more rather than pushed to the brink of satiation or exhaustion. One thing to keep in mind that many don’t think of until it’s too late is to set up the environment for success. Before you bring your new bird home, arrange its cage to minimize negative interactions. Give the cage extra bowls so that you can easily keep your bird on one side while you exchange the bowls on the other. Make sure there are service doors to avoid having to reach in, which can lead to biting. Make enrichment easy to access. Keep perches from being stationed directly over food, water and favorite toys to prevent soiling. Arrange cage cleaning so that it can be done to minimize stress. If your new bird does not go back into the cage without a negative interaction with you, wait until you have built stronger tools to take your bird out of the cage when it can return under positive conditions. It’s not worth the detriment to you and your bird’s relationship to miss on a short period of time of exercise. And finally, use your three C’s: communication, consistency, and choice when coming up with a behavior management program for a new challenge. Let the bird communicate with you through its body language and respond accordingly. Instead of stonewalling, find ways of maximizing the bird’s calm, desirable behavior. Aim for consistency with whatever behavior goal you have in your sights. Just as a dog would get confused if sometimes it were allowed on the bed and sometimes it were not, your bird will get confused or frustrated if sometimes we stand there and let him show aggressive behavior and other times we try to train for calm behavior. When offering your bird choice, arrange the environment and interactions in such a way that the bird is volunteering to move into the behavior we want rather than away from a behavior we don’t want. This can take a keen eye to decipher what the bird is actually wanting to do, rather than what the bird is avoiding doing. With the right approach, this will produce faster results with longer-lasting success. 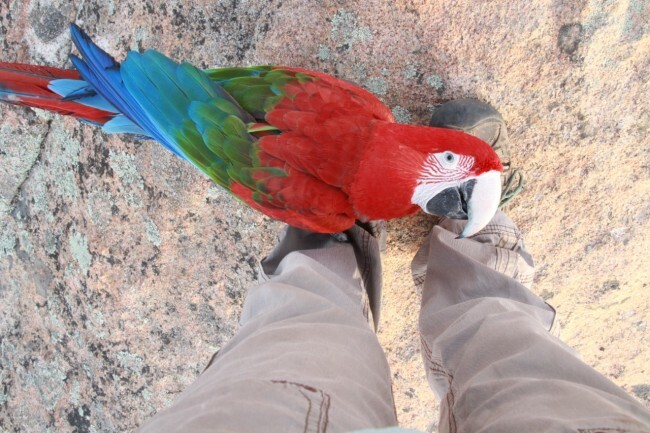 This entry was posted in fostering parrots, Problem Behaviors, Training and tagged Aggressive behavior, body language, Environmental Arrangement, macaws, taming, training session. Bookmark the permalink.